7709 Adam Steven Circle, Louisville, KY 40220 is a distinctive two story four bedroom home positioned on a secluded cul-de-sac in Bradford Grove. 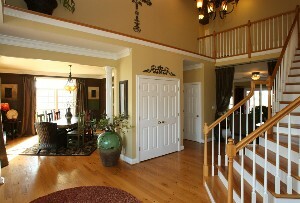 An open foyer contains gleaming hardwood floors and welcomes visitors into a nearby Great Room. 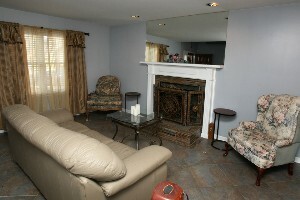 The Great Room has fantastic character and an eye catching fireplace surrounded by custom tilework. The Great Room connects to a good sized formal dining room with crown molding and several windows for light. 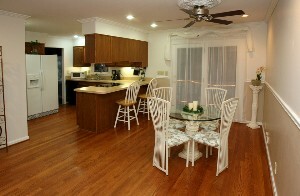 The kitchen is bright, freshly painted, and contains a large dining area accented by a decorative chair rail. A double door exits the kitchen to the covered back deck. One bedroom, a full bath, and a walk-in laundry room are also located on the first floor of the home. Two additional secondary bedrooms and another full bath are found on the second floor along with the Master Suite. Both the Master Bedroom and the Master Bath have been freshly painted. The Master Bathroom is an indulgent retreat with custom tiling, a whirlpool tub, separate shower, and large well-lit vanity area. The basement of the home has been partially finished with a nice Living Room and includes over 500 square feet of unfinished space as well! 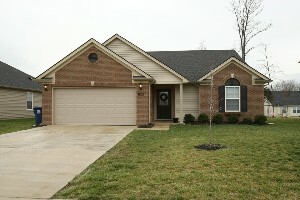 7709 Adam Steven Circle, Louisville, KY 40220 has had numerous updates including a new roof in 2010. New residents will enjoy the fantastic location with quick access to shopping and dining along Breckenridge Ln. 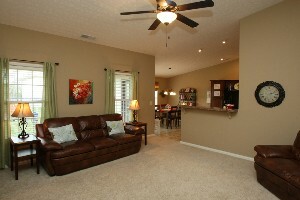 Residents in Bradford Grove also benefit from a private neighborhood Club House and Swimming Pool. 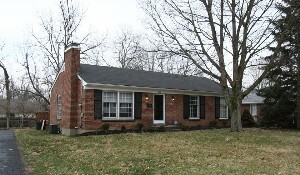 521 Leyton Ave Louisville, KY 40222 is a fabulous brick ranch style family home in Lyndon. The Living Room and Dining Room are connected, with nice flooring, several windows for natural light, and a cozy fireplace. A built-in bookshelf in the Living Room provides lots of additional storage for books, movies, and family games. The Dining Room is located off of the kitchen which makes entertaining quite convenient. The Kitchen features stainless steel and black appliances and has plenty of counter and cabinet space for food preparation and storage. The Master Bedroom is peaceful with subdued decor and a private bath. The two secondary bedrooms are good-sized with new carpeting. The home has a large partially finished basement. There is an unfinished area for storage and a partially finished Living Area. The living space has been freshly painted but will need new flooring. The back door of the home connects the kitchen to a spacious deck which is perfect for cookouts and outdoor gatherings. The yard has a couple of trees and is surrounded by a chain link fence. 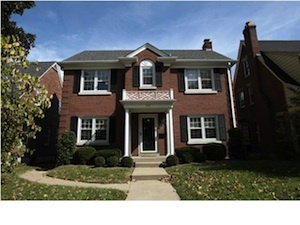 521 Leyton Ave. Louisville, KY 40222 is move-in ready with numerous updates. The current owners have completely renovated the main bathroom and freshly painted the entire home including baseboards and ceilings. The location is awesome with quick access to local shopping including Oxmoor Mall and Mall St. Matthews. This home is sure to please. The Lynn Thomas Team is hosting an Open House this Sunday January 22nd from 2:00-4:00pm at 1222 Royal Ave. La Grange, KY 40031. What a beautiful family home! This lovely 3 bedroom 2 bathroom ranch has neutral decor and is move-in-ready. 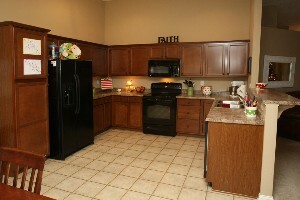 The kitchen is large and features lots of cabinet and counter space and black appliances. The Great Room is spacious with vaulted ceilings. A large Master Suite contains a walk-in-closet and a Master Bath with dual vanities. The home is located in the Majestic Woods subdivision in La Grange and is a fabulous option for any family in the Oldham County area. 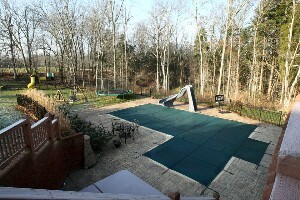 Don't miss the Open House this Sunday January 15th at 9610 Mary Dell Ln. Louisville, KY 40291. 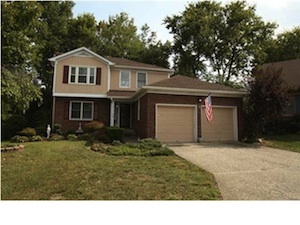 This cheery home in Fern Creek promises to give its new owners many years of enjoyment. The home features three separate family living areas and a large private yard, perfect for entertaining. Easy access to local shopping and recreational activities along with tasteful interior decor give this home great appeal. The home contains three bedrooms, two full and one half bathrooms, and over 2,000 square feet of living space. Please contact us for additional information and come out to see this beautiful home this Sunday January 15th from 2-4pm! This Sunday January 15th, we will be hosting an Open House at this attractive three bedroom home in Crestwood. The home has been meticulously maintained and features a hardwood two story Foyer, a nice Eat-In-Kitchen with lots of cabinet space, and a lovely Great Room with vaulted ceiling. The Master Bedroom is spacious and will comfortably fit a king size bed. The home also has a good sized upstairs Bonus Room as well as a Finished Basement which is perfect for a guest suite or an additional family living space. 7119 Apple Orchard Ln. 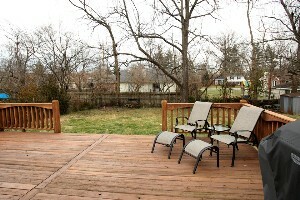 is located in the desirable Poplar Hils subdivision on a large corner lot. Call us for additional information about this home and come out to take a look this Sunday! This absolutely gorgeous cape cod style home at 4808 Jolynn Wolf Way Fisherville, KY 40023 could easily be featured on the cover of Better Homes and Gardens or Southern Living Magazine! 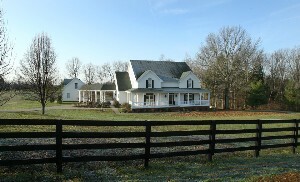 The home is seated on five lovely acres of partially wooded land. A four board fence surrounds the property. The large front porch is inviting and instantly charms guests. Upon entering the home, one takes in the bright and spacious foyer with extensive crown molding, pegged hardwood floor, and a striking staircase (perfect for family photos and holiday decor). The dining room contains four windows that stretch from floor to ceiling bringing in natural light that gives the sizeable space a warm glow. 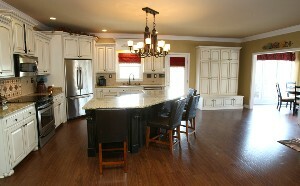 The kitchen is fabulous with stainless steel appliances, granite counter tops, hardwood flooring, and a breakfast bar. Openness to the great room makes entertaining easy and convenient. Windows surround the breakfast area and provide a 360 degree view of the grounds. The first floor Master Suite has access to the back deck, and a new Master Bath includes two separate sink areas, granite counters, and a tiled shower. The upstairs bedrooms are all generously sized and the bathroom layout gives multiple house guests and family members plenty of space to get ready each morning. A walk-out basement showcases ten foot ceilings and an entertainment space with a full bar. Another bedroom with a private bath, a work out room, and a room that the current owners use as a theatre are also located in the basement. A sound system runs throughout most of the home and onto the back porch. The custom built pool and patio area combine with the natural beauty of the acreage and make visitors feel as though they've entered a resort. The backyard space has accomodated parties with more than fifty guests. A detached three car garage features a space above which is ready to finish into an apartment, studio, or office and has a separate staircase for access. 4808 Jolynn Wolf Way Fisherville, KY 40023 is remarkable and is certain to give its future owners happy memories and a peaceful retreat to call home. The Lynn Thomas Real Estate Team is so excited to participate in the Downtown Wedding Show at the Kentucky International Convention Center in Louisville, Kentucky this weekend! The show will take place this Friday January 6th, 2012 in the Cascade Ballroom from 5:00-9:00pm. We will have a booth and be available on site throughout the show sharing lots of helpful information about home purchases with our Brides-to-be! The show promises to be an evening of fun with many of Louisville's most reputable wedding vendors present. 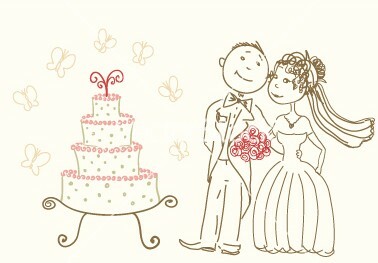 Vendors will display options for honeymoon travel, wedding cakes, formal attire, DJs, jewelry, florists, and more!. A few of the participating venues include The Seelbach Hotel, The Frazier History Museum, and The Gillespie. The Lynn Thomas Team specializes in assisting newlywed homebuyers by providing quality information, fabulous communication, and first and foremost by looking out for the needs of each individual buyer. We recognize the volume of important decisions newly married couples face and take pride in easing the stress of a home purchase. Come and check out our booth at the Downtown Wedding Show at the Kentucky International Convention Center this Friday! We would love to meet you and chat about your future plans. This Sunday January 8th, we will be hosting an open house at this elegant all brick three bedroom, three full and one half bath home. Located across the street from the Baptist Theological Seminary, this home offers a tranquil setting, beautifully landscaped exterior, and over 2200 square feet of interior space. Numerous updates and a recent price reduction make this home one you will not want to miss. 403 Godfrey Ave is waiting to welcome you home. For further information please give us a call. 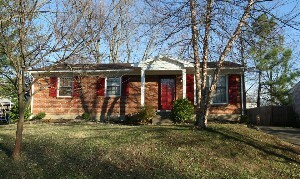 1222 Royal Ave La Grange, KY 40031 is an attractive ranch style home in the Majestic Woods subdivision of La Grange, KY. 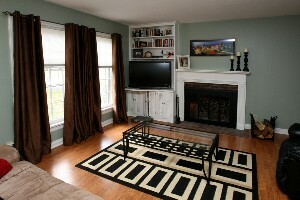 This home is completely move-in ready with splendid upkeep and warm decor. The home's covered front porch leads into a spacious foyer followed by a welcoming Great Room The Great Room features a vaulted ceiling and decorative plant display ledges. A good sized kitchen contains upgraded cabinetry with plenty of storage, counter space, and black appliances. The dining area can accomodate a large table or dinette. The dining room exits to the relaxing Covered Patio area in back of the home. A split floor plan places the Master Suite on one side of the home and two secondary bedrooms on the other. The Master Suite is sizeable with a walk- in closet, vaulted ceiling, and a master bathroom with dual vanities! An additional bathroom is located between the two secondary bedrooms. 1222 Royal Ave La Grange, KY 40031 is the perfect family home with convenient access to Oldham County Schools as well as local shopping. 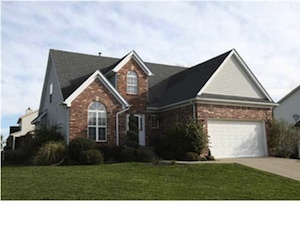 Nice curb appeal, a roomy interior, and a two car attached garage make this an ideal choice. Please give us a call for additional information or to set up an appointment to see 1222 Royal Ave today!